Flossing daily is recommend to go hand in hand with tooth brushing to disturb the deposits in between teeth that your toothbrush can’t quite reach. Since starting as a Dental Hygienist, I have found that most people have a complex, for some reason or another, about flossing their teeth. I have many clients sitting in the dental chair feeling guilty for not flossing for some weeks or, any many cases, since their last appointment! The main message to pass on is that I am a Dental Hygienist, not the Dental Police. The recommendations we make are proven to be the most effective to aid in the prevention of gum disease and tooth decay. However, we understand that flossing is something that can fall by the way side when life gets busy (like the vaccuming!). 1-Use the Spool Technique (as pictured). 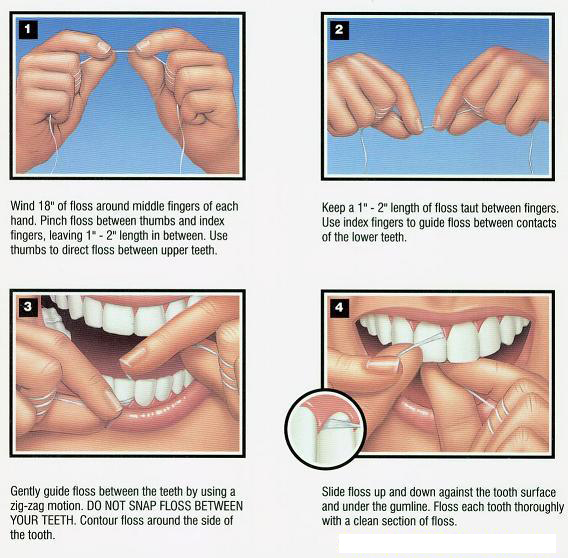 A lot of people avoid flossing because they don’t know how or find it difficult…but it doesn’t have to be. The Spool causes less damage to the gums and you have more control to make it effective than traditional methods. Also it is important to move the floss up and down both sides of teeth for a thorough clean. Having a trigger activity that reminds you to floss is a great idea. activity that makes you think ‘time to floss my teeth’ will help you get in the habit. 3-Floss while doing something else. I have heard of all sorts of strange places that clients like to do their flossing. (Shortland Street! ), before brushing their teeth etc. Leaving a pack of floss on your night stand, lounge table, glove box, bathroom cupboard is all it takes..if it’s there you might just use it (we hope). lovely and healthy. Otherwise don’t hesitate to make an appointment with me to discuss flossing or alternative forms of care for in between your teeth. Other aids might be to use Interdental Brushes, Floss Holders, Super Floss and can be demonstrated at your routine Hygiene appointment.